This article is a perfect example of how cities are responding to mass homelessness by sweeping homelessness under the rug and ignoring the causes or effects of the situation. Responding to homelessness by pushing people “away” and never asking why they are where they are in the first place does not end homelessness or help those without housing. It just moves people along to somewhere else. One tactic that is used to divert responsibility for homelessness in the city is to re-name the homeless folks there “transients.” This term effectivity “otherizes” them making them “someone else’s problem.” All people who are homeless, however often they move, has the same daily needs to sleep, sit, eat, otherwise survive, in public. Furthermore, I happen to know that most of the people staying out in this area of Englewood were not travelers but were local Colorado folks who used to stay on the streets in Denver but have been pushed out to Englewood by the Denver sweeps. These folks are not “transients” they are people experiencing homelessness. Another tactic used to divert responsibility from the cities to the homeless people is not to speak at all about why they were there, and where they went after being swept from there. Englewood officials sound surprised that there is such a massive increase in people sleeping along the river in Englewood. If the reporter had interviewed the people who are homeless staying in this area they would know that a good majority of them were homeless in Denver and were swept by Denver police farther and farther out of town over the past couple of years. Another tactic used to divert responsibility for sweeping homeless people away to nowhere, is to refer the people to resources. The Englewood officials say their goal was to connect the homeless people to resources, but story is not finished to mention that the resources that person actually needs, like attainable housing, are not available. Most people do not want to be homeless. 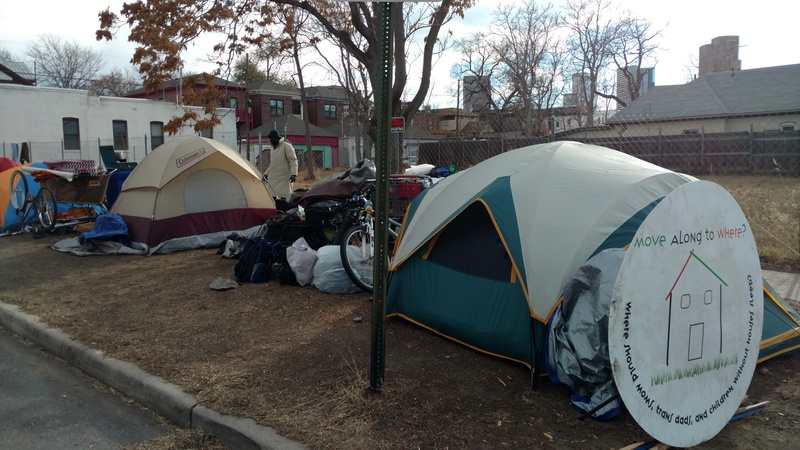 332 out of 333 homeless people who were offered housing through the recent Denver SIB program took the housing. Cities cannot continue to claim they have done their part by sending an outreach worker to talk with a homeless person about non-existent housing after they are swept from their place of survival. So what about all that money spent? Englewood officials try to blame homeless people living on the river for all the degradation of trees in the area. This is a long shot at best. Claiming all this need for new trees is due to about 30 people who have only been staying in this area of the river for the past few months is stretching this effect to a ridiculous level. The city quotes the total cost of this sweep at $39,122.30. This includes, trash services, police hours, public works hours, and the bulk of the cost is arbor mediation. If the city would provide trash services to the river side as opposed to using police to sweep homeless people along to some other city riverside or streets, this cost would be much different. It would have cost the city $1,118 if they had just done trash removal and not criminalized those people for surviving. It is time that cities stop sweeping homeless people “away” to somewhere else and never take responsibility for their need to survive somewhere because we continue to have inadequate housing options.